Established in 1978, Pine Ridge Vineyards produces classically proportioned, expressive wines that embody their history and distinct place of origin. Pine Ridge founder Gary Andrus, inspired by the illustrious wines of Bordeaux, believed in the Napa Valley’s potential to produce wines of similar stature. He planted the property’s original namesake vineyard on a steeply terraced hillside flanked by a dramatic ridgeline of pine trees in the Stags Leap District. Gary’s pioneering efforts with this first vineyard were met with tremendous success as the Bordeaux varietals he planted thrived and produced wines of great distinction. In the following years, Pine Ridge continued to acquire exceptional vineyard sites across the region. Today, the Estate’s 200-acres span over five renowned Napa Valley appellations – Stags Leap District, Rutherford, Oakville, Carneros and Howell Mountain. In the early 1990s, Pine Ridge crafted this unusual blend as an experimental bottling and it has since become one of the estate’s most popular wines. 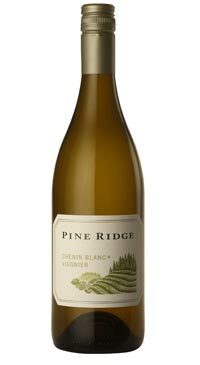 Traditionally, in their native France, Chenin Blanc and Viognier would never be blended together, but Pine Ridge has proven how well suited the two are to sharing a bottle. The core of the blend, Chenin Blanc, is picked at low sugar levels to retain it’s crisp character and vibrancy, the 20% Viognier is harvested at higher sugar levels to accentuate its ripe stone fruit and floral aromas. The resulting wine is a synergy of bright fruit and floral aromas and flavours with the zesty acidity of Chenin Blanc balanced by the viscosity of Viognier. Flavours of lemon curd, melon and sweet mango and orange blossom abound. With such balanced acidity, the wine is very versatile when pairing with food; try it with light salads to seafood to foods with a hint of spiciness as its subtle sweetness provides balance to the dish.